Prezentare (Piano Solo Songbook). 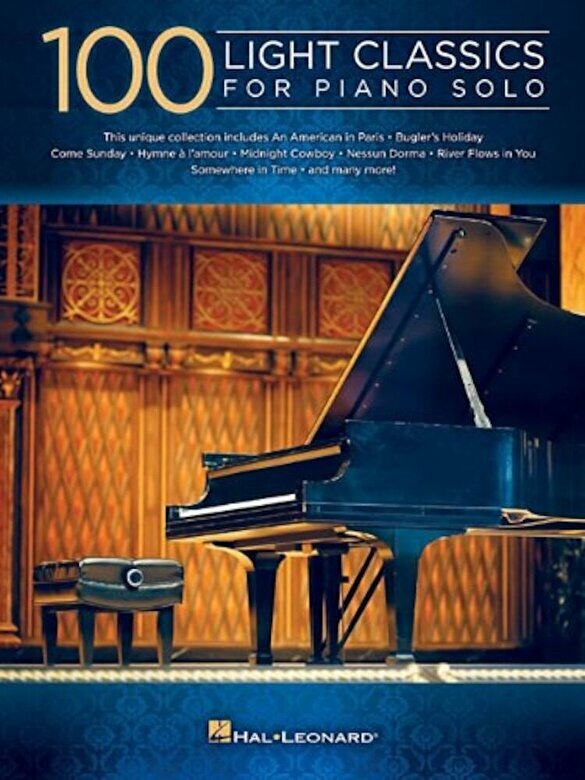 This unique collection features 100 piano solo arrangements of light classics by George Gershwin, Leroy Anderson, Edith Piaf, and more. Songs include: An American in Paris * Bohemian Rhapsody * Bugler's Holiday * Clair de Lune * Come Sunday * Eleanor Rigby * Forrest Gump Main Title (Feather Theme) * Great Escape * Hymne a L'Amour * James Bond Theme * A Lover's Concerto * Midnight Cowboy * The Music of the Night * Nessun Dorma * Theme from ``Ordinary People`` * Rhapsody in Blue * River Flows in You * Somewhere in Time * Star Wars (Main Theme) * Waltz of the Flowers * A Whiter Shade of Pale * and many more.